Beef Wellington cooked perfectly while wrapped in puff pastry, ham and the most amazing mushroom duxelles made with cognac duck liver mousse pate. We love making beef centered meals that taste delicious and are full of flavors. Among our most popular beef meals are Slow Cooker Corned Beef, Slow Cooker Beef Teriyaki, and Wine Roasted Beef Tenderloin. 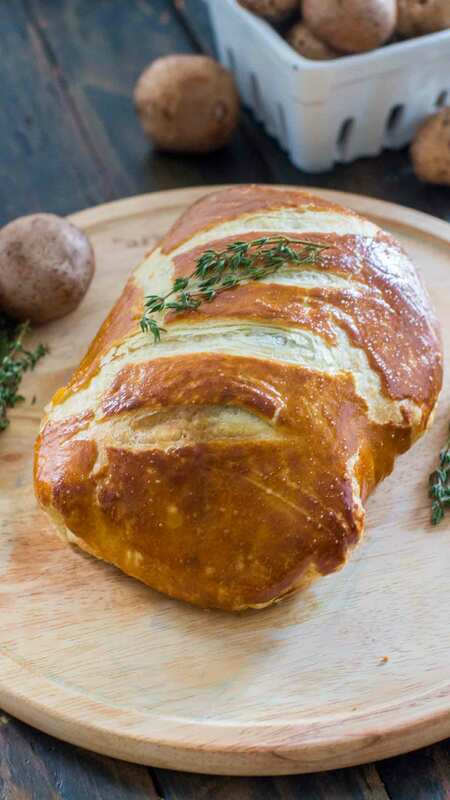 This Beef Wellington is such a classic and delicious recipe. First time I had it was at a French restaurant in the heart of NYC on New Year’s Eve. I ordered one, and while it cost like and an arm and a leg, it was totally worth it! Since then, I am a fan, and love to make homemade Beef Wellington for the holidays. This one is made with Duck Liver Mousse with Cognac. 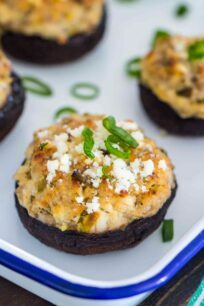 While the name sounds intimidating, and if calling it “Wellington” wasn’t enough, the recipe involves more complicated wording like “mushroom duxelles”, don’t let all this confuse you! Making Beef Wellington is actually pretty easy. The recipe involves a few simple steps with easy to find ingredients! So push the fear away, and start on this amazing, show stopper meal! First, start with good meat, if you are not sure which cut to get, I recommend asking your butcher. This is a beef centered recipe, so quality is highly important. Definitely sear the beef, don’t skip this step, you want the outside to be a nice golden brown, that will add so much flavor! Also, when making the mushroom duxelles, make sure you watch it closely and stir often. The more the moisture reduces, the higher chance to burn the mushrooms. Stir often until paste forms. I used regular, so to say, hot-dog mustard. 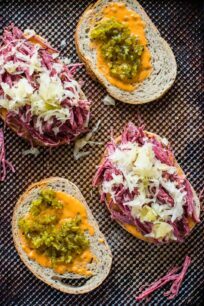 I also tried this recipe with honey mustard and I loved the results. Letting the beef cool before you cover it with mustard and the pate mixture is also very important. To make wrapping the ham easier, get the rectangularly shaped ham slices, not the round ones. Puff pastry must be thawed at room temperature for at least 3 hours before using it in this recipe so plan accordingly. I like my Beef Wellington cooked medium. Mine was made with 1lb filet and it took me exactly 35 minutes to cook it. 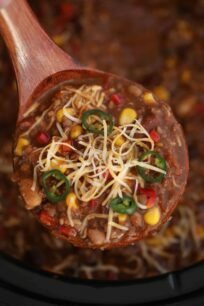 Reduce the time by 5-7 minutes if you want it less done and use an instant meat thermometer for best results. I mixed ALEXIAN Cognac Duck Liver Mousse Pate into the mushroom duxelles. However, but you can also use their Champagne Pate or the Truffle Mousse Pate. They are also amazing on a piece of warm crusty bread, just saying! What is the Mushroom Duxelles? Is a finely chopped, sometimes minced mixture of mushrooms sautéed in butter and reduced to a paste. Sometimes onions or shallots, and herbs are added. Beef Wellington cooked perfectly while wrapped in puff pastry, ham and the most amazing mushroom duxelles made with cognac duck liver pate mousse. Season beef fillet generously with salt and pepper. Place a cast iron skillet over high heat, once hot add two tablespoons of olive oil and sear the fillet on all sides until well browned. After adding the filet, let it brown for about 1 minute, gently lift up one end just a bit to see if it browned, if no, cook for 1 more minute. Once browned, remove the filet from the pan, place it on a plate and let it cool. Drain excess fat from the pan. Once cooled, brush the fillet on all sides with yellow mustard. Finely chop the mushrooms and add them to a food processor and purée. Add them to the pan on medium heat. Cook, stirring often and allowing the mushrooms to release their moisture. You will have to cook them for about 5-8 minutes, the end result should look like a mushroom paste. Remove the mushrooms from the pan and set aside to cool. Once cooled, mix in the duck liver mousse into the cooked mushrooms. Stir well to combine. Add a large piece of plastic wrap to the surface of a chopping board. Lay out the slices of ham onto the plastic wrap so that they overlap, basically creating a rectangular out of ham. Spread the mushroom mixture over the ham. Place the beef filet in the middle, roll the mushrooms and ham over the fillet, using the plastic wrap. Wrap it tightly, twist the ends of the plastic wrap to secure and refrigerate for 20 minutes. Roll out the puff pastry sheets onto a baking sheet covered with parchment paper. Unwrap the fillet from the plastic wrap, cut it in half so you have two 1lb pieces and place each in the middle of the puff pastry dough sheets. Brush the edges of the pastry with the beaten eggs. Fold the pastry around the fillet, cutting off any excess at the ends, try to limit the overlap. Place the pastry-wrapped fillets onto a baking pan, seam side down, and brush beaten egg yolks all over the top. Chill for 5-10 minutes. Brush the exposed surface again with beaten eggs. Score the top of the pastry with a sharp knife slightly. Sprinkle the top with coarse salt if you want. Bake at 400°F for 25-35 minutes. The pastry should be nicely golden when done. For a medium-rare roast, test it with an instant read meat thermometer. Pull out of the oven at 125-130°F for medium rare. Slice in 1-inch thick slices and serve. Gosh I adore Beef Wellington!!! This looks impressive. This looks as good as at best restaurant, great presentation! 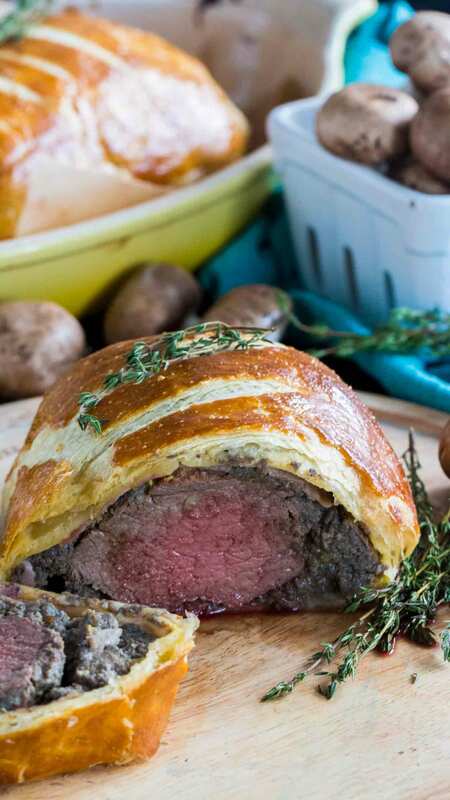 I’ve always wanted to make Beef Wellington… totally trying this! omg this is gorgeous!! 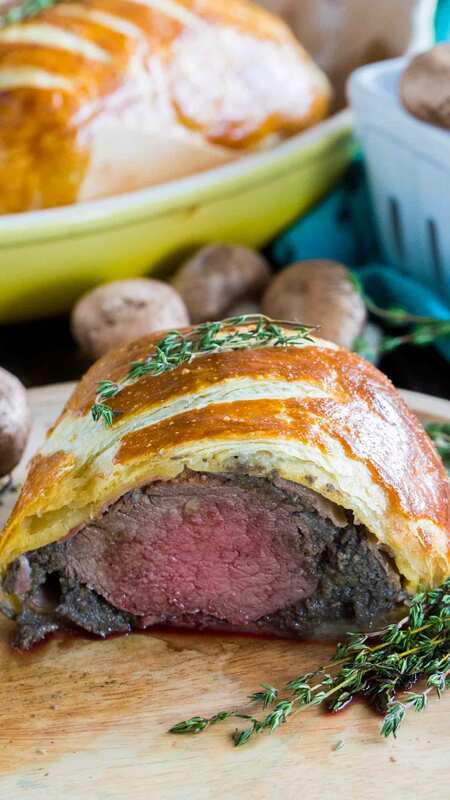 I’ve been wanting to try Beef Wellington and have been considering it for Christmas dinner, but I’m too nervous to do it for such an important meal! Wow!! This Beef Wellington looks so beautiful and festive!!! This sounds simply amazing! Perfect for Christmas dinner! I want a big slice of this right now! Yum! That pastry looks perfectly cooked! This looks perfect! 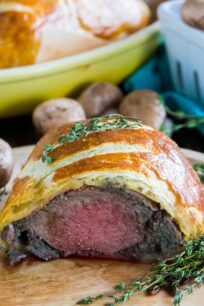 I’ve always wanted to try making beef wellington!